Frederick Clifton Pierce, Batchelder, Batcheller genealogy, , at https://archive.org/details/batchelderbatche00pier . Chicago, Ill.: W. B. Conkey Company, (1898) , p. 204. "New Hampshire Marriage Records, 1637-1947," database with images, FamilySearch (https://familysearch.org/ark:/61903/1:1:FL65-65M : accessed 24 January 2016), Joshua Bachelder and Molly Towle, 06 Mar 1806; citing Northampton, , New Hampshire, Bureau of Vital Records and Health Statistics, Concord; FHL microfilm 1,000,963. Mary D. Batchelder was born perhaps about 1812. Nathaniel Batchelder was born perhaps about 1807. "Massachusetts State Census, 1855," database with images, FamilySearch (https://familysearch.org/pal:/MM9.3.1/TH-267-12392-193146-87?cc=1459985 : 1 April 2016), Middlesex > Watertown > image 11 of 44; State Archives, Boston. "New Hampshire, Marriage Records, 1637-1947," index and images, FamilySearch (https://familysearch.org/pal:/MM9.1.1/FLC4-XQJ : accessed 02 Dec 2012), Earle Clifton Bates and Hester Ruth Sivret and null, 1932. "United States Census, 1940," database with images, FamilySearch (https://familysearch.org/pal:/MM9.3.1/TH-1961-27877-13364-5?cc=2000219 : accessed 11 September 2016), Massachusetts > Worcester > Shrewsbury Town > 14-242 Shrewsbury Town bounded by (N) Maple Av, Main; (E) Grafton; (S) Town Line; (W) Town Line, Boston Turnpike, S Quinsigamond Av, Oak, Boston Turnpike, Crescent; also Shrewsbury (part), White City (part) > image 2 of 54; citing Sixteenth Census of the United States, 1940, NARA digital publication T627. Records of the Bureau of the Census, 1790 - 2007, RG 29. Washington, D.C.: National Archives and Records Administration, 2012. Thomas W. Baldwin, Vital Records of Cohasset, Massachusetts, to the year 1850, Boston: Wright & Potter Printing Company, (1916) , p. 23. Thomas W. Baldwin, Vital Records of Cohasset, Massachusetts, to the year 1850, Boston: Wright & Potter Printing Company, (1916) , p. 179. Steve J Plummer, The Wheelwright Genealogy, , at https://books.google.com/books?id=0Q-MAgAAQBAJ . Cloth Wrap Publishing, (2010) , p. 41. Steve J Plummer, The Wheelwright Genealogy, , at https://books.google.com/books?id=0Q-MAgAAQBAJ . Cloth Wrap Publishing, (2010) , pp. 41-2. "Massachusetts Births and Christenings, 1639-1915," database, FamilySearch (https://familysearch.org/ark:/61903/1:1:FC3F-J51 : 4 December 2014), Esther Battle, 28 Oct 1819; citing Orange, Franklin, Massachusetts, bk 1 p 66; FHL microfilm 770,464. 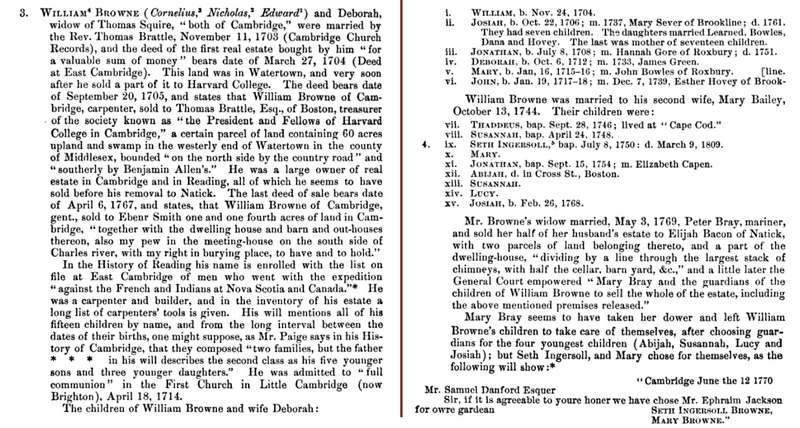 "Massachusetts, Town Clerk, Vital and Town Records, 1626-2001," database with images, FamilySearch (https://familysearch.org/ark:/61903/1:1:FH9L-LYS : 13 July 2016), Ebenezer Shackley and Esther Battles, 11 Jun 1844; citing Marriage, Barre, Worcester, Massachusetts, United States, , town clerk offices, Massachusetts; FHL microfilm 754,012. 1880 United States. Census Office. 10th census, 1880 federal population census, Washington, District of Columbia: National Archives and Records Service, ([19--]) , Census Place: Cambridge, Middlesex, Massachusetts; Roll: 543; Family History Film: 1254543; Page: 374D; Enumeration District: 433; Image: 0392. Joseph Nickerson Baxter, Memorial of the Baxter family, Boston: Press of W. L. Deland and Son, (1879) , p. 10. "Massachusetts Marriages, 1841-1915," database with images, FamilySearch (https://familysearch.org/ark:/61903/1:1:NWRT-FS6 : 17 February 2016), Frederick H. Nazro and Mary A. Bayfield, 12 Jun 1871; citing Boston, Suffolk, Massachusetts, United States, State Archives, Boston; FHL microfilm 1,433,030. "United States Census, 1900," database with images, FamilySearch (https://familysearch.org/ark:/61903/1:1:M9YL-23D : 20 January 2015), Mary A Nazro in household of Murray Chuner, Precinct 2 Boston city Ward 21, Suffolk, Massachusetts, United States; citing sheet 1B, family 30, NARA microfilm publication T623 (Washington, D.C.: National Archives and Records Administration, n.d.); FHL microfilm 1,240,686. Lucius Robinson Paige, History of Cambridge, Massachusetts. 1630-1877: With a genealogical register, , at https://books.google.com/books?id=Yc00AQAAMAAJ . New York, Cambridge: H. O. Houghton and Company, (1877) , p. 502-503. 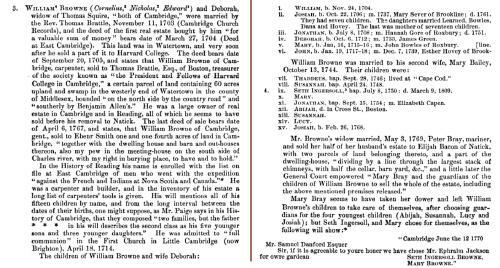 Harriet H. Robinson, "Nicholas Browne of Reading and Some of His Descendants", The New England Historical and Genealogical Register Vol. 44 (1890): p. 283. Augustine George Hibbard, History of the town of Goshen, Connecticut, , at https://books.google.com/books?id=OutSAAAAYAAJ . Hartford, Conn.: Press of the Case, Lockwood & Brainard Co., (1897) , p. 424. Some Death Notices from the Cedar Springs Democrat, Cedar Springs, Kent County, Michigan, , at http://kent.migenweb.net/towns/cedarsprings/deaths.html . , "BEACH, FRANK died at Sand Lake, MI., Jan. 14, 1904, under suspicious circumstances. Post Mortem showed a diseased liver. Mrs. Beach shot herself before funeral, Jan 17 and died Jan 22; buried near Grand Rapids. He left dau. Hester McCarthy of Grand Rapids; two brothers of Grand Rapids. Mrs. Beach was born Belle Pierce of Grand Rapids, MI (Jan. 20, 1904.)" "United States Census, 1900," database with images, FamilySearch (https://familysearch.org/ark:/61903/1:1:MSM1-WMY : 20 January 2015), Frank Beach, Nelson township Sand Lake village, Kent, Michigan, United States; citing sheet 4A, family 92, NARA microfilm publication T623 (Washington, D.C.: National Archives and Records Administration, n.d.); FHL microfilm 1,240,723. "Michigan Marriages, 1868-1925," database with images, FamilySearch (https://familysearch.org/ark:/61903/1:1:NQ36-DTP : accessed 7 April 2016), Frank Beach and Belle Pierce, 16 May 1896; citing Big Rapids, Mecosta, Michigan, v 3 p 264 rn 1666, Department of Vital Records, Lansing; FHL microfilm 2,342,504.